When I was a kid I loved to run. No, I'm not talking about jogging. I'm talking about hard as you can, head forward, arms pumping and heart racing, run as fast as you can running. Forget that cross country, run for miles marathon stuff. Miles are for walking. This was racing. You and a buddy do your own "on your marks", running to see who was the fastest, "who could get to the pre-determined goal first" running. Sometimes it was barefoot in the yellow clay running. Our feet would be yellow dusty and muddy brown from the sweat that would run down our legs to mingle with the dust. It was glorious. Our hearts would pound as we fell to the side of the old road and laugh, call each other names and declaring ourselves the winner. 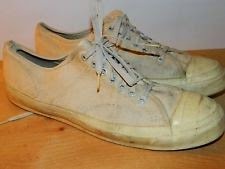 Much of the time we ran in our old, beat up converse low tops.When PF Flyers were on TV we learned we could "run faster and jump higher". I don't know that Mama was convinced that I needed to run faster OR jump higher. The only other choice available was Red Ball Jets. High tops were for basketball, low tops for every day wearing. For running, for racing when we had gravel to race over. Sure, our feet were leather tough and gravel was not near as painful then as now, but a stone bruise could mean a loss instead of a win in the world of country road racing. Much of the time it was whatever shoe was on sale, regardless of my desire to run faster. Forget jumping higher. White was the color of choice. They seldom stayed white, however. They became dirty pretty quickly, sort of dingy gray dirty. Forget bleaching them, Mama. That dingy color was a badge of honor for "tennis shoes". Of course, I never played tennis. 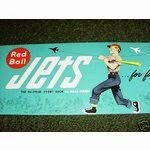 That is just what they were called if not called Converse, PF Flyers or Red Ball Jets. 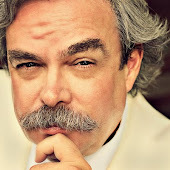 In high school at Oneida Baptist Institute (a "settlement school" in the mountains of Clay County, Kentucky) I had grown out of the need to wear Red Ball Jets or PF Flyers. Those were for kids. Converse was the only reasonable choice. Now, I was too nearsighted to play on the baseball team. Too uncoordinated to play on the basketball team. We didn't even have a football team and honestly, when I grew into those big old feet I had I was 6'2" and weighed 129 soaking wet with my clothes on... and pockets full of rocks. But I could run. I didn't have the makeup to be a distance runner, I was a sprinter. I joined the track team and competed in the 100 yard dash, the 220, I ran as the last leg of the 880 relay and when forced to do so, the hurdles. I hated hurdles. My long legs got tangled up in them too often. Running wasn't about jumping over things like some kind of horse. It was about looking ahead, not left or right and just running as hard as I could. I could outrun anyone at OBI in the 100 yard dash. Sometimes we ran barefoot, just because it felt good. We wold walk the lanes to pick up any pebbles and rocks in our lanes and race barefoot. That was the best. Most of the time, especially at track meets we ran in our Converse low tops. Mr Kilgore was the Coach for most things athletic. He was the gym teacher, Basketball and Baseball coach for the A Team and track coach. Mr Barnes coached the B Team basketball and assisted with track. Mr Kilgore was short, handsome and single and all the girls swooned over him. Single, quiet and a nice guy. That is until track season came around. To get our endurance up we would run over to the track fields at Oneida Elementary School where we would practice. It was over a mile and we ran there because we had to or not get there. He would drive the school bus over and we mostly rode it back to campus. Notice I said mostly. Mr Kilgore would time me as I ran the 100 yard dash. If I had a slow speed he would let me run back to campus rather than ride back. "Steve, with that time I'm gonna let you run back." Gee, thanks. We didn't have all the fancy equipment. Not enough starting blocks for everyone, for example. We had two sets. If more than two ran in a heat someone would just kneel and set in the dirt. I loved the feel of the dust and dirt from the track on my knuckles as I knelt, raised up and waited for the starting gun to push away and run. Most of the time the other athletes we ran against came from the little County High Schools around us in Eastern Kentucky. Many times they didn't have much more equipment than we did. Much of the time the other runners simply wore their Converse as well. And I won, every time I ran against them in the 100 yard dash, I won. We were going to the Regional Track Meet eventually and I wanted to get a medal soooo bad. Track didn't get you a letter jacket, just a letter. A big blue and white "O". I wanted to win Regional and go to State my junior and senior years. I did both years. I did win the 100 yard dash at the Regionals both years. And yes, I got that little brass medal on a red, white and blue ribbon. Not as cool as a letter jacket, but cool. It also got me a seat at the Sports Banquet and TWO Blue and White "O" letters. Mind you, others won their events, we won the 880 and I had a medal for that, but that was a team effort. All that was overshadowed when Cathy Carmack won State in the Shotput! We all forgot our wins as we watched and cheered her on. But don't let me forget the main reason for writing the first of this dozen. Someone somewhere donated a whole box of TRACK SHOES to OBI! I'm talking red kangaroo leather, light as air track shoes with replaceable spikes. My, they were so soft and the leather was thin. The spikes gleamed as we rooted through the box to find our sizes. Several guys wore size 11D and I held my breath as I scrambled for a pair for myself. But as I grabbed for a pair, I knew a secret. Most guys were trying on pair after pair, looking for the right fit. I saw the size was stamped in white on the tongues of the shoes. Then I grabbed a pair, "11W". Can you believe it? 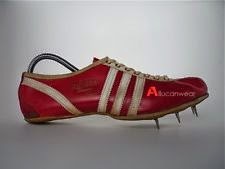 A pair of red kangaroo leather spikes that weren't just 11D, but were my actual 11 W size. 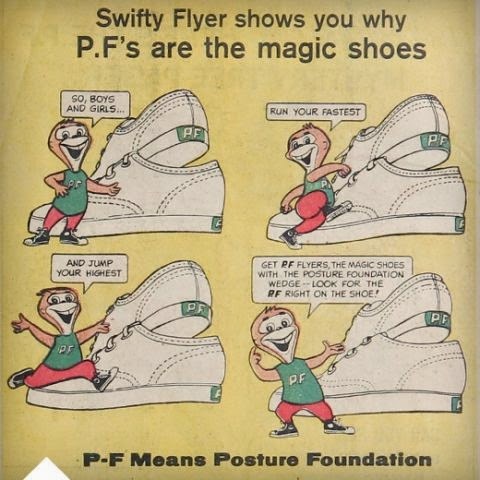 You think PF Flyers made me run faster and jump higher? Those red shoes made me The Flash, Superman, Jay Garrett - the Original Flash, Thor even! Running to the Oneida Elementary School track was so cool the first time. As we ran along the side of that old asphalt road the long spikes sunk into the warm asphalt as we ran. My feet were so much lighter than when wearing my low top Converse. That is when Mr Kilgore upped the ante for me and the other guys running the 100 yard dash. The girl's track team practiced at the same time. He called the three girls who ran the 50 yard dash over and placed them on the half way mark to the finish line and placed me and another two boys at the starting line. He explained with a slight smile that when he fired the starting gun the girls AND the boys would start at the same time. If the boys lost we had to run back to campus. The bad thing was my little 5'2" girl friend was one of the runners on the 50 yard line. She laughed and waved. When the gun went off I ran as hard as I could. I saw her long blonde hair ahead of me and though I came close that first time, she and another girl beat me across the finish line. As we ran back to campus my buddy Pat was on the outside of the pack when a car came along. He moved over before I did and stepped on my right foot with one of those long spikes puncturing my red kangaroo leather track shoes AND my foot. The foot puncture cleaned up, though I still have a small round brown scar there to this day. It was the shoes that I was upset about. There was a puncture hole in my red kangaroo leather track shoes. The wound also slowed me down for a few days and the girls won time after time. It took about 5 times before I won. Then I won again and again and Mr. Kilgore stopped using the girls on the 50 yard line. We had Regionals and hopefully State to prepare for. Yep, we competed against other small school districts. There were 3 levels, Class A, AA and AAA schools. AAA schools were the smallest in the state. I really didn't care that I didn't compete against the Class A or AA athletes. I wore those red kangaroo leather track shoes and won the 100 Yard Dash at Regionals two years in a row. And yes, Mr Kilgore made me run those hateful hurdles. I never won, never wanted to run them. I came in 2nd or 3rd in the 220 and our team won the 880 Relay. They we went to the State Track and Field Competition. I so wanted to win, but had no idea how fast the other boys were that I ran against. We ran in heats and I made it to the final heat. I think there were 6 or 8 boys who took their place as the starting line. When the starting gun went off I ran my heart out. I didn't want to lose. I wanted to win, to take home a state trophy. But I came in 4th. Yes, it was humbling, it was hard to stand with my bare shoulders heaving and watch as three other boys laughed and were pounded on the back. Those red kangaroo leather track shoes maybe weren't as magical as I thought. Mr Kilgore told me I did a great job. I had my best personal time ever. He thumped me on the back and told me he was proud of me. Other team members side bumped their bodies into mine, pounded me on the arm and echoed "good job" over and over. But 4th place doesn't get a medal. We were so proud of Cat Carmack for winning the State Girl's Shotput. She carried the shotput onto the school bus and we handed it around to feel the weight. We held her trophy and cheered her as she basked in her win! We were OBI. We sang much of the way from Louisville to Oneida, laughed and cheered for ever so long. Our Track and Field Team had a great day. At the end of the season we had to turn in our uniforms ( I seem to remember hey were really old basketball uniforms. White with OBI on the front in blue and a team number on the back). We also had to hand in those red kangaroo hide track shoes. I marked mine my junior year and wore them again my senior year. Later on some boy probably wondered who had written "Hollen" on the tongue of those shoes. He might wear them his year in Track and Field, but those were my red kangaroo leather track shoes. My name on the tongue and that single puncture mark on the right one made it so. I can't fly like the wind any longer. A jog is about all the steam I can work up and that is leisurely rather than a competition. But in my mind I am 16 again. The wind is on my face and I breath deep as I run, hard and fast, my heart pumping, my legs like pistons as I race toward that point that is the finish.